Like true nomads, you will glide along the stream for an itinerant and exceptional adventure! 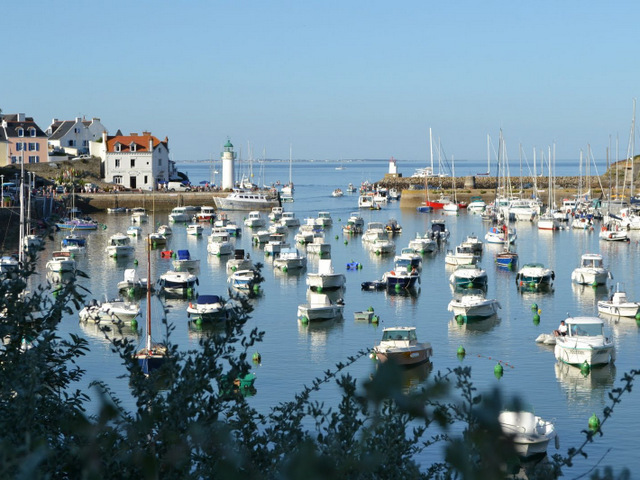 From Quiberon, you will enjoy the exceptional beauty of the islands of Houat, Hoëdic and Belle-Île. 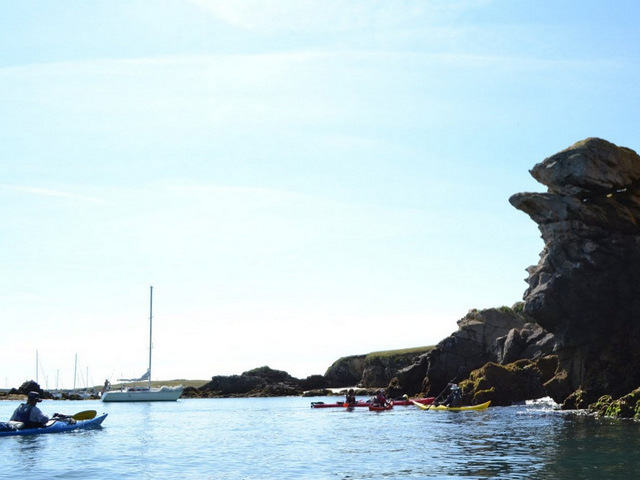 Your experienced guide will initiate you to different techniques like mapping, tidal streams… In the evening, you will admire wonderful sunsets, in particular on Houat with a view on its granitic rocks. Under your tent or under the stars, you will appreciate the relaxing atmosphere and the gentle lifestyle of Morbihan, by living close to nature. 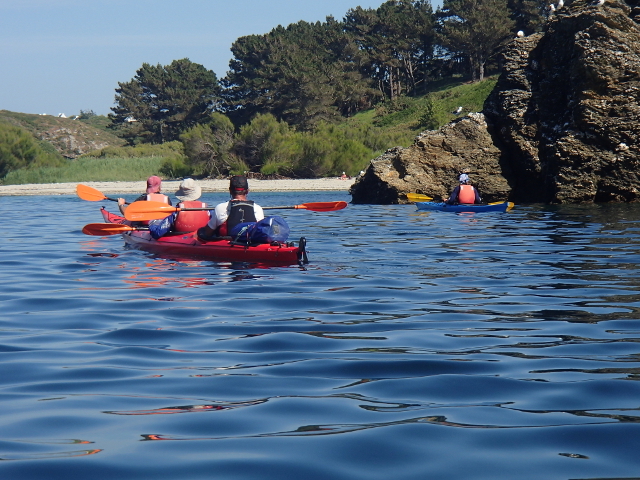 If there is not a tour scheduled or available when you’d like to go sea kayaking, let us know. We may be able to schedule one just for you! Early morning: meeting at 9am in front of the parking lot of the SEMAPHORE at the entrance of Quiberon where you can leave your car during the stay (attended paid parking, 1100 parking spots, 02 97 30 59 45). It is around 48 euros to leave your car for a week. Transfer by minibus up to the Pointe de Conguel from where we will leave. Then, we will go through the description of the tour around a warm drink and then will prepare the kayaks for the afternoon trek. 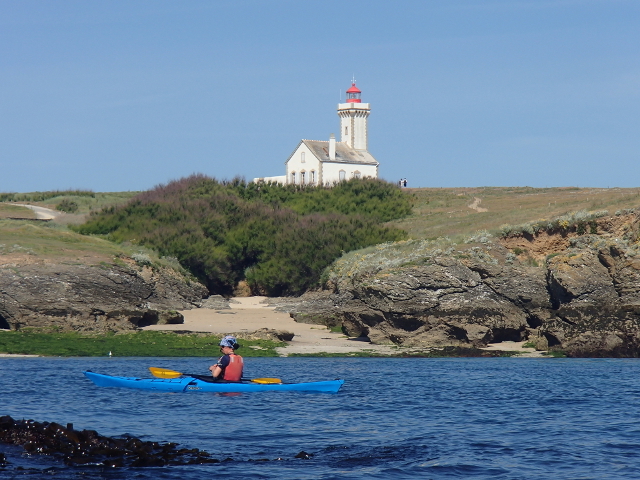 In the afternoon: after lunch, introduction to kayaking navigation along the Pointe de Conguel. The route, which separates us from Houat, is a succession of rocky islands and beacons and it ends with the small islands of Glazic and Valuec. Along the way, we won’t fail getting closer to the famous Teignouse lighthouse. Our bivouac will be on the Tréach er Béniguet beach. Given the name, no doubt, we are in Brittany! 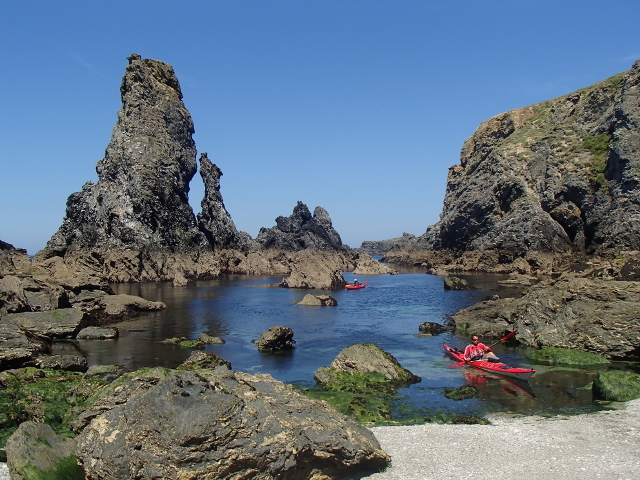 Today, we’ll paddle along the wild coast of Houat and discover its granitic cliffs and its golden sandy beaches, some of the most beautiful ones in Europe. Houat, whose motto is ‘Ag er mor e viuamb’ wich means ‘We rely on the sea’ still lives on the fishing industry. The numerous small fishing boats and crab boats we will admire during a walk are the witnesses of a flourishing present. Once at the Pointe of Beg Tost, we will leave Houat to join its smaller sister, Hoëdic, and we’ll bivouac in Porz Guen. No paddling this morning. We’ll put our hiking shoes on to discover the charms of Hoëdic Island, one of the wildest of the Ponant. In the late morning we’ll reach the Pointe du Vieux Chateau. Like pirates and Robinson Crusoe, we will have lunch on a desert island: Lîle aux Chevaux (The horses Island). 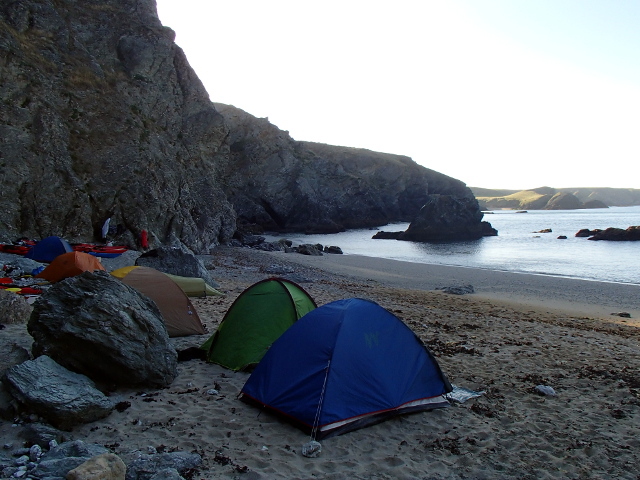 After a nap or a swim we’ll head for the Pointe de Kerdonis in Belle Ile to spend the night in Port Andro campsite (showers available). Going west, the cliffs are higher and the coast even more cragged. 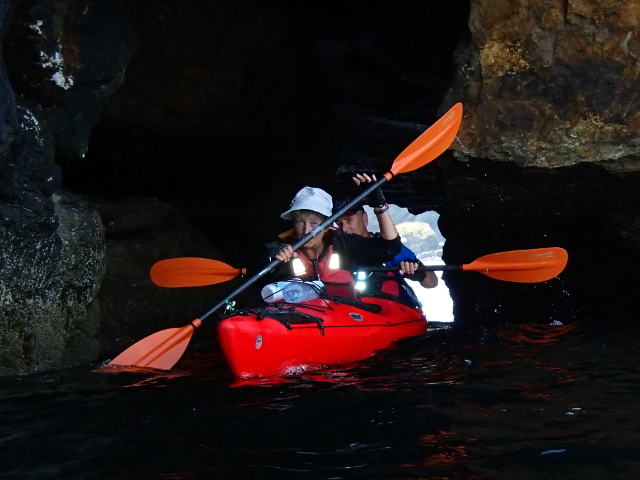 Gliding along creeks, we will discover numerous caves. Hardened by the previous 4 days you will safely follow the instructor in the most cramped passes. 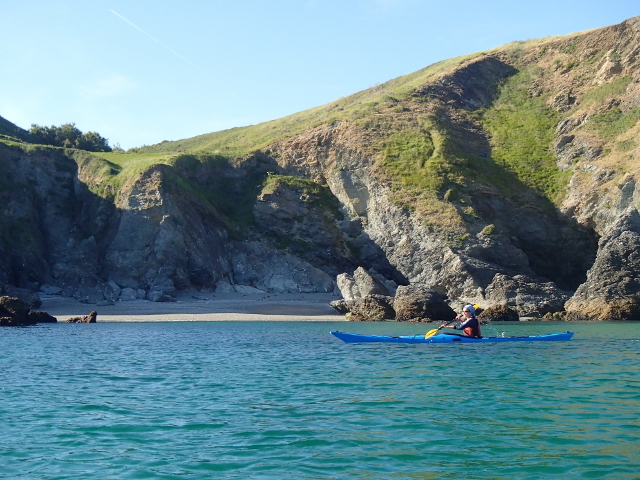 While navigating, we will discover numerous shelters: first Port Maria and Port Blanc, then Port Lost-Kah and Port de Pouldon behind the head of Port Pouldon. We’ll stop near the magnificent beach of Herlin to bivouac. This is one of the most beautiful sites in Brittany. We’ll still navigate to the west. On the rocks you’ll see some goose barnacles. The Creek of Goulphar is the place where goose barnacles pickers live in their small boats. Shortly after, we’ll navigate near the famous needles of Tricky Port, immortalized by the impressionist Claude Monet. Then, further north, the local surfing spot: the beach of Donnant. It is a good opportunity, for the volunteers, to get into the waves and ride them. Before joining the creek of Ster-Vraz, we will have a look at The Apothicairerie’s cave. If the conditions are mild, we’ll get inside. We’ll navigate at the foot of the magnificent Pointe des Poulains lighthouse. Just behind us, Sarah Bernhardt’s house, a famous French actress who was deeply in love with the area. Sure you’ll fall in love with the site too! Once beyond the head, we’ll glide along the greenest coast of the island. Then we’ll enter Sauzon. Port Fouquet is the ideal place to bivouac for the night. Depending on the tides, the activity will end around 4pm. Meeting on Sunday at 9am on the parking lot of Belle Ile, at the entrance of Quiberon. Saturday around 4pm in Quiberon. 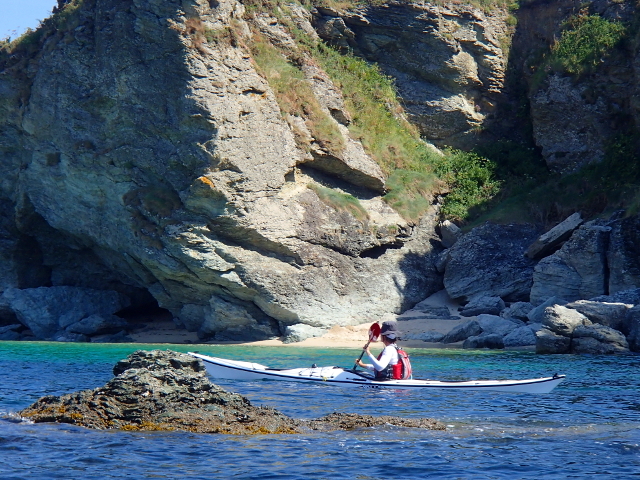 You will paddle 4 or 5 hours a day, with strolls that will allow you to discover the astonishing scenery. You must be at ease in the water and physically fit. If you don’t already have an experience in kayaking, you must have, at least a regular physical activity. Do not hesitate to contact us for any further questions. It includes one-man and doubles kayaks (Necky, PH, Valley, RTM brand) in which all the stuff is boarded to sail in full autonomy. We also provide dry bags but make sure you have your own one to keep your camera dry, and don’t forget to bring plastic bags in case of rupture. Even if the watertight compartments are large, you have to take the strict minimum. The sizeable stuff (laundry, sleeping bags, tents, mattresses) will be placed at the boat extremity (nose and tail), and the thick and heavy items (can, water) will be against the cockpit partitions. To fully benefit the currents, paddling times will depend on the tides. Nights are planned in in a tent or under the stars if the weather allows it, and one overnight stay will be in a campsite. You need a sleeping bag and an self-inflating sleeping pad. Cold meals for the afternoon, and hot meals will be jointly prepared for the evenings. Attention, there will be few showers on the road, so you will have to bring soap, which will foam in salt water (you can find one at a ship chandler) and wipes. No toilets! You have to bring toilet paper, wipes and a lighter to burn your waste. 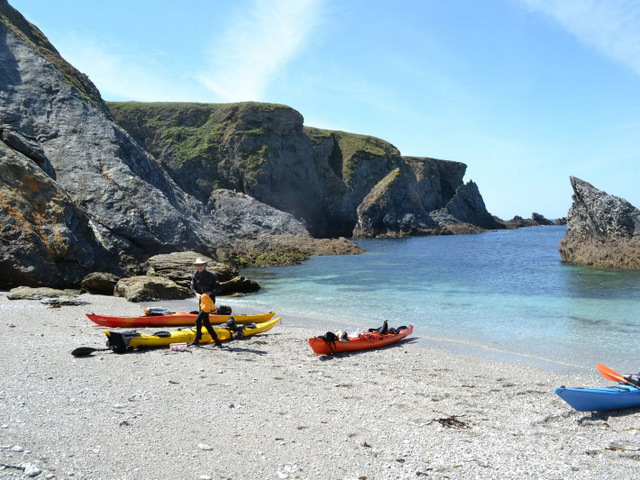 Experienced guide who holds a diploma in kayaking and the associate qualification of sea kayaking. A minimum of 5 people, a maximum of 12. By car: N165, exit Quiberon. By plane: Lorient airport (60 km away) and Air France daily flights from Lyon and Paris. The journey (round trip) to the meeting place, tips, drinks, voluntaries insurance, cost for the parking lot. Set aside a small budget for drinks, personal living expenses and eventual tips. You have to check your gear and do not hesitate to consult us. Safety but also comfort for your kayak tour depends on it. Along the way, you will not be able to buy gear and medicine. EVENINGS AND FREE-TIME (NO NAVIGATION) Plan extra hot and comfortable clothes. Camera (pay attention to any water contact). If your device is not tight or not provided with a tight case, it will remain in the tank while navigating.